Thermal fatigue cracking failure of die casting production, mold repeatedly stimulated cooling and heating effect, the molding surface and internal deformation are involved, and the repeated cycles of thermal stress, leading to tissue structure of two injury and loss of toughness, causing cracks appeared, and continue to expand, once a crack expanding, and molten metal liquid impact, coupled with repeated mechanical stress crack accelerated expansion. Therefore, on one hand casting mold must be fully preheat starting. In addition, in the production of the die casting die in must be kept in a certain temperature range, so as to avoid the early cracking. At the same time, to ensure the mold production and manufacturing of internal no problem. Because of the practical production, the majority of the ineffectiveness of the die thermal fatigue cracking. Fracture failure of the shot under the action of force, die in the weak point of crack, especially the molding surface scribing traces or electric machining marks are not polished optically, or molded clear corner will appear first fine crack, when the grain boundary exists brittle phase or coarse grains, which is easy to break. And brittle fracture crack growth quickly, the mould invalidity is very dangerous factors. Therefore, on one hand where mold surface scratches, electric machining marks must be polished light, Zinc Die Casting even when it is in the gating system position, must also be polished. Additional requirements by use of the mold material of high strength, good plasticity, impact toughness and fracture toughness were good. Molten failure previously said, conventional die casting alloy zinc alloy, aluminum alloy, magnesium alloy and copper alloy, but also pure aluminum die casting, Zn, Al, Mg is the more active metal elements, they and the die materials has the good affinity, especially Al easy to bite mold. When the mold hardness is high, then the corrosion resistance is better, and the molding surface if the soft point, then on the corrosion resistance of adverse. 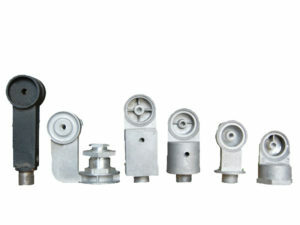 The die failure of many factors, both external factors (for example, whether the mold casting temperature preheating, water paint spraying quantity, die castings machine, die size matching tonnage, high pressure gate speed too fast, cooling water open and die-casting production synchronization, casting materials and components, the discretion of Fe the casting dimension shape, size, wall thickness of coating type etc. ). There are internal ( cases of mold material metallurgical quality, blank forging process, the mold structure and the rationality of the design of gating system, the rationality of the design, mold machine ( EDM ) generated during the processing of internal stress, the mold heat treatment technology, including a variety of matching precision and smoothness requirements ). Die if the early failure, need to find out what the internal or external, for future improvement. But in actual production, corrosion is only die locally, cases of gate directly flushing part ( core, cavity) prone to corrosion phenomenon, and the hardness is easy to appear soft aluminum Alloy Die Casting adhesive die.